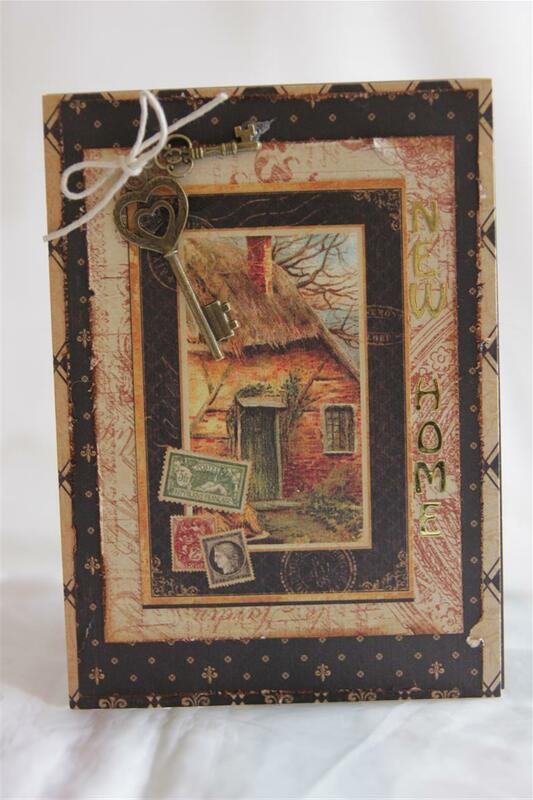 Graphic 45 French Country New Home.. 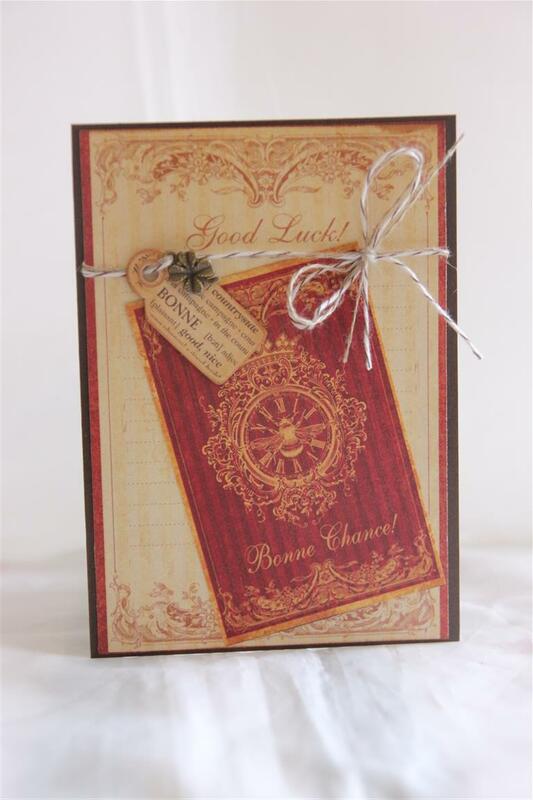 I have found a whole folder of cards that I made last month that I haven’t posted yet. 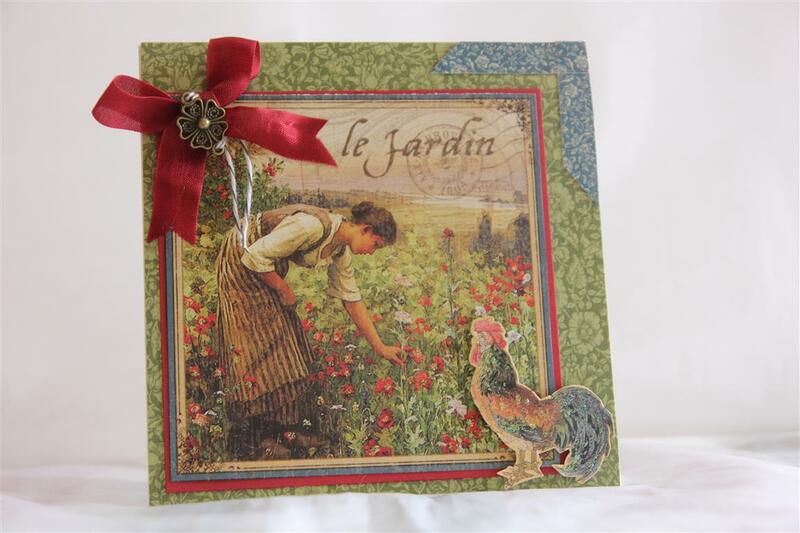 They are a big mix of all sorts, so we will get started – This one is Graphic 45 French Country papers, and I layered 3 in decreasing sizes ( distressing as I went) and added the last one with the image on top. I have a box of great charms, so dug through that to find the keys which I tied together with some string.I had a lovely lesson with my favourite ladies today, and have done a little relaxing this afternoon just finishing up a few projects before I head back to work next week. this weekend will be spent working on some december classes.Til tomorrow…. This is the last in my Graphic 45 French Country series for now – i have a couple more but they are waiting to be photographed so tomorrow we will return to the true romance series to finish that one off. I did a bit of matting and layering on this card, and distressed all the edges and inked with Tea Dye distress inks.The little bike image was laying on my desk so it ended up on the card as well – I think it came from a piece of Kaisercraft sears and sons paper. 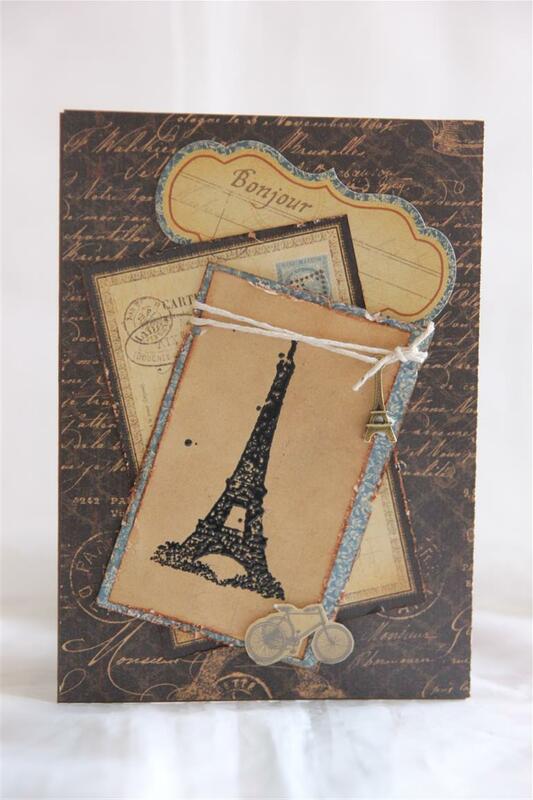 The Eiffel Tower was stamped, and heat embossed – the stamp is from Stampin Up artistic etchings stamp set. I tied some string with a charm attached around one of the layers. Til tomorrow…. I was always going to do something with this image on one of the Graphic 45 french Counrty papers. 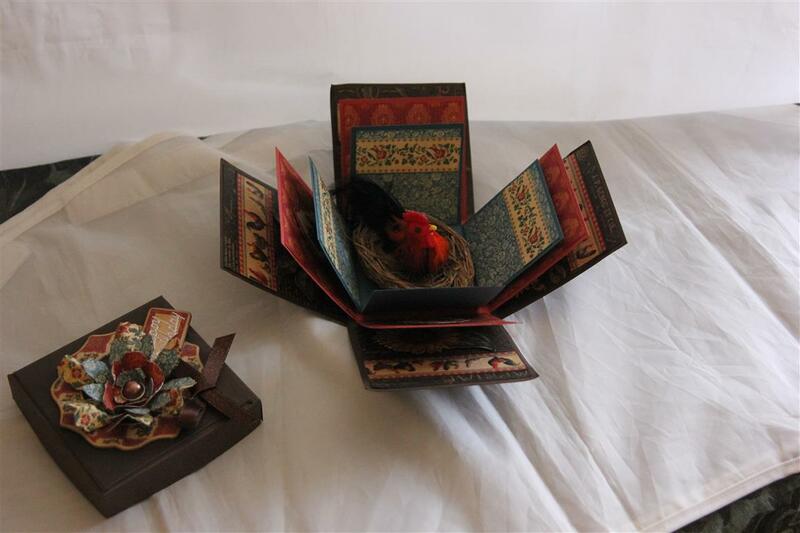 It’s a lovely picture, so i have matted itwith red cardstock,and fussy cut a rooster to pop on the corner. I used a strip of paper to make into a corner and added a seam binding bow tied with bakers twine and a charm to finish.This one may end up framed on my craft room wall!Had a lovely afternoon cardmaking with one of my most favourite people, and now I am ready to sit and watch a little t.v. with a nice cup of tea! til tomorrow…. I made this exploding box for my Mum for her birthday. 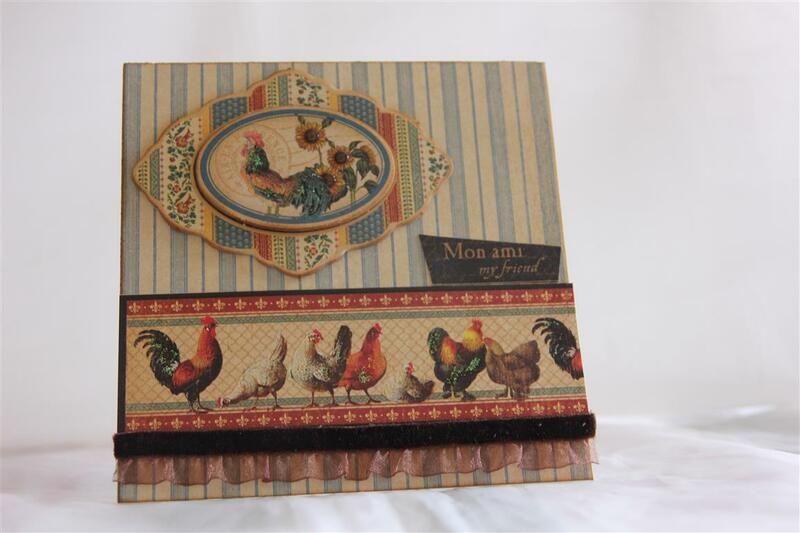 She loves roosters ( I don’t know why) so it was easy to decide what to put inside it, and Graphic 45 french Country papers were a perfect match to decorate the panels inside the box. 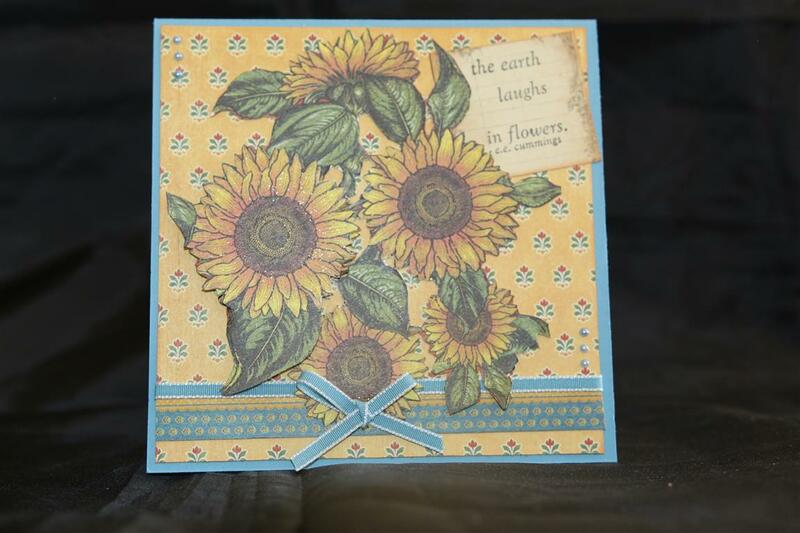 I used Sizzix tattered florals for the flower on the lid, and the only other thing I needed for this project was 3 1/2 12 x 12 sheets of bazzil to construct the box with. I repeated this project for a class, and everyone passed with flying colours! It truly is a simple box with lots of wow factor. I have done a youtube clip with all the measurements and a step by step guide to show you how to do it yourself. You will be able to access this here, and it will always be available by clicking on the youtube icon over there on the right of my blog! Til tomorrow….